The kind of Heartless nightmares are made of. In addition to having high Strength, it can use its shield to repel attacks, and it will teleport after you if you try to create some distance. Attempt this fight knowing that it may be your last. The number above this brute gets smaller with every Medal you use. Once it reaches 0, there's a slim chance it'll unleash a devastating attack. 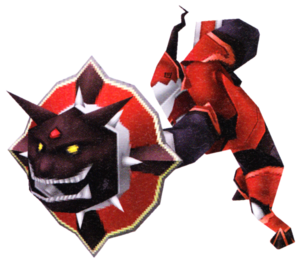 The Eliminator is an Emblem Heartless that is introduced in Kingdom Hearts Re:coded. The Eliminator resembles a knight clad in purple and red armor with white trim and yellow buttons; it also has the tell-tale Heartless zig-zag jawline, with a purple head and a silver jaw. The arms and torso are also proportioned much larger than the head and legs, the arm not holding the Eliminator's main weapon actually rests ape-like on the ground. In battle, the massive and fearsome shield is the most upfront and visible portion of the Eliminator. The barrier portion of the shield is a simple red and purple-red pattern with white trim, but far more prominent is the very large and very dangerous red-black dog head, complete with sharp fangs and spiked collar. The dog also has three glowing eyes arranged in a triangle formation, two yellow eyes on the bottom and one red eye on the top. The Eliminator is a palette swap of the Defender. An Eliminator, like Gold Tricholomas, will appear randomly when Sora enters a new System Sector while a terminal is opened. It will shoot three orbs of energy that when hit, will inflict a random status effect and effectively decrease Sora's HP, but if he is close enough, it will hit him with its shield. While both attacks can be blocked, they deal a great amount of damage. It also teleports when it is far from Sora, encountering one may cause death and loss of a large amount of SP to Sora if he isn't well-equipped. It is also immune to all status effects and it will guard against frontal attacks. To avoid fighting it, run to a door that leads to a terminal. By doing this, the Eliminator will not follow Sora to the other room, but it may cause another to spawn in the other System Sector. The maximum amount that they will appear on a floor is equal to how many rooms are on that floor. 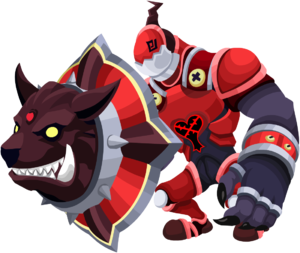 Equipping Oathkeeper is recommended, since its LV1 Clock ability is Undo, which protects Sora from all status effects. Ideally, one would walk up close so that the Eliminator would use its lunge attack, but quickly roll out of the way to get in a few swipes. Repeat as needed, however keep in mind that if the Eliminator is using the three blasts attack, it will track Sora down as he tries to get behind it. It is somewhat slow to unleash a first volley, so it's also safe to use the HP Cheat to reduce all HP to 1 before fighting it, then get behind it and attack as soon as it appears. A safe and effective (though time-consuming) strategy is to equip the Armor Bangle and Energy Earring for their Round Block and Block Charger abilities. Simply block every attack the Eliminator uses until the Energy Earring maxes out the Clock Gauge. Then, use either the D-Thundara or D-Thundaga Finish Commands to safely deal heavy amounts of damage. Repeat if necessary. Alternatively, block all of its attacks until it charges, then get behind it and use Judgment Triad, which is especially effective against single targets. Using the HP Cheat, as mentioned earlier, can be used to easily defeat the Eliminator. If trying to get behind it is too hard or too risky, equip Hi-Ethers and make sure Mega Flare is the MAX Overclock attack. Go into a room where an Eliminator is not present, but is in another room. Use two Hi- Ethers to get MAX Overclock, then head to the room. It will appear far away from you at first, but when it teleports right next to Data-Sora, immediately unleash Mega Flare. It's a much safer way to deal with it, and is especially useful when trying to defeat multiples of them on a floor. The maximum amount that they will appear on a floor is equal to how many rooms are on that floor. For example, if there are 5 rooms on that floor, then up to 5 can appear, but after all rooms have been cleared of bugs. This can be very helpful when going for the chips it drops on all 4 difficulties, granting more defeats in the Enemy Profile of Jiminy's Journal, and more chances for chips. Defeating the Eliminator for the first time will result in obtaining the Eliminator's End trophy and a Trophy Chip to go with it as well. Defeat an Eliminator in a system sector. This page was last edited on 3 April 2019, at 17:18.